Have you been at all critical of this data? 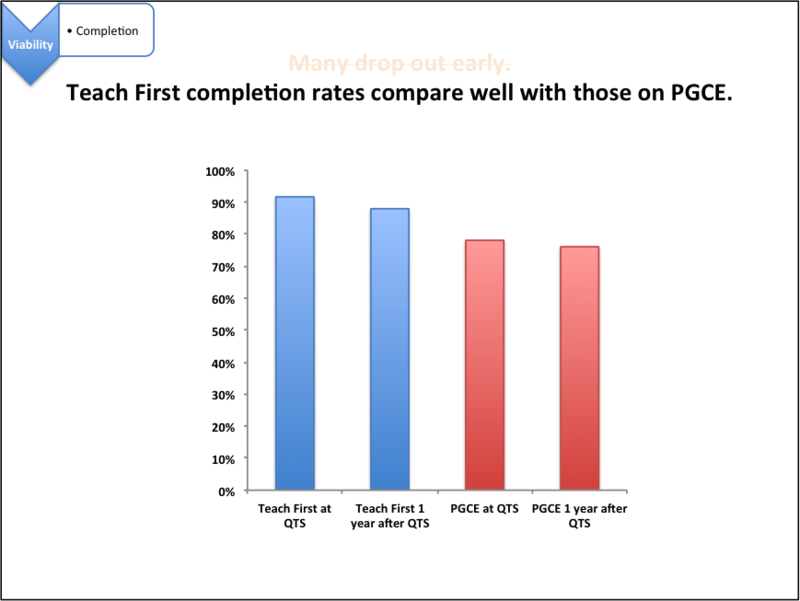 In 2005 two teachfirst cohorts had obtained QTS (if that’s what “qualifying” means). Tf strategy, driven perhaps by a slight insecurity about the programme’s chances of success, was to market it as a stepping stone onto other careers. The relatively small numbers (less than 200 in each year) also cast doubt in reliability. Strategy now has changed. There has been a drive to encourage professionals (bankers, management consultants, civil service high flyers) to come into teaching via this route. It is doubtful whether other routes would be as attractive to them. This has had some success. In any event, if there is a difference between the people tf recruit and those who go into other streams (as is often proclaimed “posh oxbridge types”) then how does tf fare at retaining this type of person, compared to traditional teacher training routes. Perhaps they are a less sticky, more mobile type of person anyway? As a final point, critics of teachfirst usually trumpet this dubious data but I am often led to wonder why it should matter so much anyway. If figures have remained at 42% then 42% of close to 2000 is a pretty decent number who will stay in teaching for 5 years or more. As a profession teaching has a relatively high turnover of staff normally. I would say it was a lot rarer for a teacher to remain on one school for their entire carter in comparison with other industries. This mobility is based on the fact that each year is separate and so teaching continuity from year to year is not assured anyway. This being said, I would much rather have a sequence of enthusiastic graduates on teach first, experimenting with innovative educational techniques and with passion than a jaded teacher pulling out the same PowerPoint they have done for the past 8 years. TeachFirst doesn’t create better teachers, it would be ludicrous to claim that was true, but the same must be said for pgce. TF attracts hundreds of people from industry and enables them to use their knowledge and experience of the real world to inspire their students. These are people who are changing the lives of thousands of children up and down the country, people who wouldn’t have been able to get into teaching without teach first.